At 1st Sight is a modern and vintage home shop based in Fort Greene, Brooklyn that offers an eclectic mix of mid century, modern, industrial, and bohemian home furnishings and decor accessories. At 1st Sight brings in new inventory daily and aims to fit all budgets. Follow the blog and our Instagram account to see what's new in the shop, along with our daily happenings and latest inspirations. To view a piece in person or browse the entire collection, you can make an appointment to visit the studio. Located at 20 Grand Ave #506, Brooklyn, NY, 11205, the At 1st Sight studio functions as an office, workspace, and showroom. 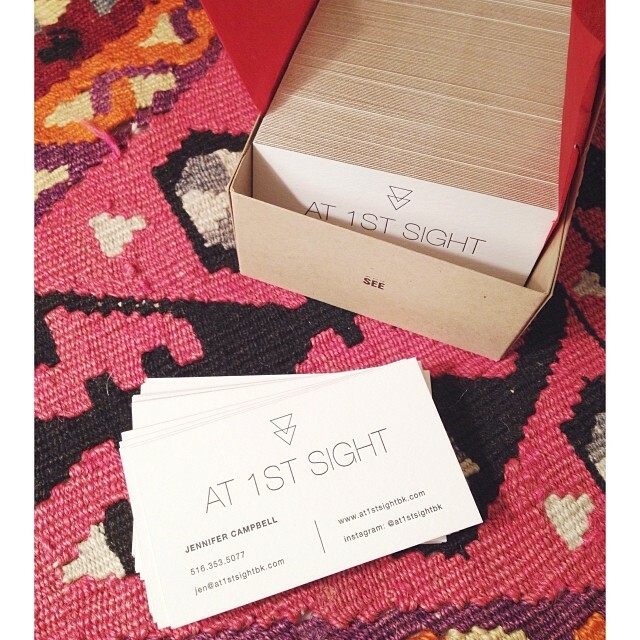 To visit the studio, contact us or send an email to at1stsight.store@gmail.com. At 1st Sight began in 2012 when Jen Campbell and Andrew Spanburgh decided to follow their dream of opening a business together. Despite both being native New Yorkers, the couple first met in 2009 while traveling separately in Panama. It was love at first sight. Just a week after retuning from Panama, Andrew joined Jen in Brooklyn and they have been together ever since. Even before meeting, Jen and Andrew both had aspirations of working for themselves. With Jen’s passion for interior design and Andrew's renovation skills, it was no surprise At 1st Sight was born. When they weren’t traveling, they were constantly upgrading their home with new vintage finds while always in the midst of serious furniture projects. Knowing they could find quality vintage pieces and make them more accessible to others, they started a collection and then a shop. Constantly inspired by their travels and the beautiful vintage furniture they encounter, Andrew and Jen always aim to provide their clients with pieces they will truly fall in love with. They believe your home should be filled with only items you love, and in general gravitate towards pieces that make them feel happy themselves. Almost anything along the lines of modern, mid century, bohemian, industrial or glam gets their stamp of approval. To them, an eclectic mix is always the most interesting and layering vintage with modern is the key to a well designed, signature home.